Today I said goodbye to one of the finest educators and one of the finest human beings I have ever known. Twila Norman was my boss when I first came to my district. At that time, she was the first female African American Assistant Superintendent in the District. She was a brilliant educator, someone who was always, always, always about what was best for teachers and kids. She was also a wise and classy lady with incredible people skills. I learned so much in the five years I worked for her, and she also became a dear friend. About two weeks ago, she suffered a massive stroke and passed away. Her godson read this poem at her funeral today, and I was struck by how perfectly it captured her life's work. I'm posting this today in her honor. After you read this, over to read some more great poetry at Random Noodling. 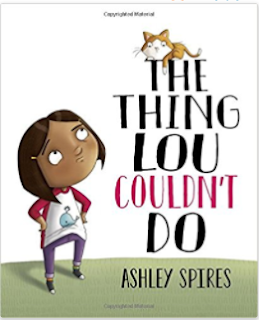 I was at the library, allegedly grading papers, over the weekend, when I stumbled across THE THING LOU COULDN'T DO, by Ashley Spires, author of THE MOST MAGNIFICENT THING (also the BINKY THE SPACE CAT series although I had never connected the two). Lou and her friends, accompanied by Lou's cat, are playing outside one day, when the friends decide they should play pirates. Up in a tree. Lou has never climbed a tree and is more than a little afraid. She makes all kinds of excuses, and tries to convince her friends that they should play pirates on the ground. Her friends are insistent however, and ultimately Lou is forced to face her fears and try climbing the tree. What I loved, loved, loved the most is that even when Lou decides she will climb the tree, she fails! She doesn't climb the tree the first time she tries! The book ends with Lou and her friends are running off to play in another part of the yard, and Lou saying she can't climb the tree, not YET anyway. Such an important lesson for kids to learn about failure! A really fun new picture book that would work perfectly in a unit on growth mindset or facing your fears. I'm buying this one to read in classes those first few weeks of school! I can't stop thinking about them. The family in the park. The family with the red RAV4 with the Pennsylvania license plates. The one with all of their worldly goods tied to the top of the car. I saw them for the first time sometime in May. There is a big recycling dumpster at City Park, only about a mile from my house. Sometimes when our recycling gets too out of control, I go over there and put big stuff- detergent bottles, cardboard boxes, broken rubbermaid bins- into the dumpster. That day, I was on my way to Colorado Springs and ran by the dumpster. The little SUV was parked close by and as I pulled up a man, probably in his late 40's or early 50's, was pulling a blue employee shirt from the local amusement park over his head. We commented on the weather, that it would be a nice day to be outside, and went our separate ways. I saw them again on Sunday night. I was walking across the park, headed back from City Park Jazz, when the car pulled up. This time, a man and woman got out. He was carrying a blue plastic tarp, and she had two buckets of Kentucky Fried Chicken. Between the two of them, they tied the tarp to the trees, creating kind of a makeshift tent, set out quilts and pillows, and sat down to eat. The cargo on top of the car included several smaller backpacks, in pinks and purples. They looked like the ones that get stuffed into the lockers at my school every day. In my head, I made up a story about the children that belonged to the backpacks. One of the two adults must be a stepparent. The children are not part of this roaming caravan, instead they are living somewhere else. And then I saw a teenage girl, maybe 15 or 16, get out of the car, take some chicken and return to the car. I wondered if she was embarrassed to be seen, or maybe she was just tired of living in such close quarters. I saw them again tonight. I was walking at the park, and not quite dusk. The family hadn't laid out their camping gear yet, evidently they were all sitting in the car. As I was walking by, the same teenage girl got out of the car, reached up and tugged a backpack off of the roof of the car. She set it on the ground and I marveled that she could find anything in such close quarters. I can't stop thinking about the family from Pennsylvania. I wonder how they got here. I want to know their story. How long they have been living in the car. Whether the father is still working at Elitches. Whether the mom works. What they do all day. What they eat. What they will do when school starts. When the weather gets cold. How they will ever be able to afford an apartment or home in Denver, where it's so expensive right now. I can't stop thinking about the family in the car. I've always said that teachers need to be learners. And more specifically that teachers need to learn something hard for them at least once a year. I've been doing that this week. I'm participating in a Tech Ed Bootcamp. It's not something I have to go to. It's PD I want to go to, because I'm a teeny bit old, and I want to make sure my tech skills are as good as the younger teachers in my building. OK, actually they're not as good, but I at least want to know what they are talking about. Yesterday didn't go so well for me. The district has replaced the platform they use for all of the online classes. I've actually been teaching a class using the new platform for a couple of weeks and it's going ok. I can log on, and view and respond to my students' work. I can show my students where things are on the page. But I keep getting lost. It feels a little like when you are in a new neighborhood, and the streets kind of loop around, and you just kind of drive in circles until you think, "Hey, I've seen that ugly purple house before." And then you set what you think is a new course, but pretty soon you are back at the ugly purple house again. That's how the new platform is going. I just haven't quite got the hang of how it's set up or where things are. And sometimes I can't find what I need even though I have seen it before. So I was excited to take a class that was called, ** 101, because I thought it would give me the basics I felt like I was missing. And then I had scheduled three more classes on related topics throughout the day. The day started out ok. The presenter had a two-column google doc, with a whole list of topics. There were links you could click on to get to different topics. We jumped right in, creating passwords, logging onto the website, etc. About two minutes in, someone raised their hand and asked, "But what is S** for? What is it supposed to replace?" And the answer felt a little vague. To me, the platform felt a lot like Google Classroom, and I wondered why we were replacing something our teachers had just spent two years learning to use. I didn't have time to think about it for very long though, because the presenter was clicking madly through step after step. And I was feeling a little panicky. I felt like every time I looked at the keyboard to do one step, I missed three more steps. There were two people from the Tech Department helping people like me, but evidently there were a lot of us, because it seemed like they were keeping really busy. At first, I tried to raise my hand and get help, but by the time the helpers got there, the presenter was several steps beyond. Finally I gave up. I spent most of the morning feeling pretty lost. At lunch time, I took a walk and gave myself a little pep talk. "You can do this," I said. "You're already using the platform. It can't be that hard. You just need a little more time, or a little more practice, or to get a friend help you a little." And I couldn't help but think about the kids I work with. How they must feel every day when they come to school. How they struggle to self-advocate. And how they don't have the benefit of a whole lot of school successes to fall back on or use as evidence in their personal pep talks. Despite my best efforts to talk myself into doing better, the afternoon really didn't go much better than the morning. I sat through one more session about how to make your page pretty. I thought I was getting it, but then it came time to download the work you had created, and it said I had used something that cost money, and needed to pay before I could download. And I couldn't figure out, then, what I had downloaded, or what I was paying for, and I finally gave up. I left before the final hour. I had had enough. Today, I had a hard time making myself go back. It's not a required training. I didn't learn that much yesterday. I could use the time for other things. I had to force myself to pack my bag and get in the car. I am so glad I did. I had a terrific day! C, the person who was teaching, not only knows a lot about computers, she knows a lot about how to teach. She calls people by name. Makes her audience laugh when she talks about going to the dollar store and buying things she doesn't really need because they cost a dollar. Starts her presentations with something really easy that any teacher can do. Shows a few exemplars, then turns people loose. Each of her presentations today had six or seven different "genre" of app. Within each genre, there were at least three choices- one easy, one medium, and one medium hard. Each app had a sample, and a tutorial, and a link to sign up. We all tried things, and collaborated on documents where we shared ideas. I went to four different sessions that C did today. In one I made a Google site. In another, I learned how to make a Civil War museum simulation. I sent an email to my social studies teacher. I got some ideas for my math and science teachers. And I had a laughed a lot. Because I am a teacher, I thought a lot about what the teacher did. How she built relationships. How her organization and all of her hard work building the presentations and embedding probably close to 200 links enabled all of us to have choice and to meet our needs. How encouraging and positive and hopeful she was. How much I learned and how successful I felt. It was a terrific day. The teacher really does make the difference. Welcome! Poetry Friday is here! Photograph by Shawn Miller, Library of Congress. This is an exciting week to host. Earlier in the week, Tracy K. Smith was named the 22nd Poet Laureate the United States. According to the Poetry Foundation, Tracy graduated from Harvard University and got an MFA from Columbia University. She has published three poetry books, THE BODY'S QUESTION (2003), DUENDE (2007), and LIFE ON MARS (2011), which won the Pulitzer Prize for Poetry. Another book, WADE IN THE WATER, will be published next spring. Ms. Smith currently teaches writing at Princeton University. "One of (my) goals as poet laureate is to make even more people aware that poems are, another resource that you can turn to" in times of uncertainty. What excites me is that I'm an ambassador for poetry, which is something that I wholeheartedly believe in and that has been an anchor and a force of stability and consolation throughout my life," she says. "I think that's good news." Here are several poems I found online. There are five poems published on Ms. Smith's page on the Poetry Foundation website. Listen to Ms. Smith read the entire poem here. You can read more about Tracy's appointment in a New York Times article here. You can read an interview/listen to Ms. Smith on NPR here. Leave your link in the comments below. I have comment moderation, so you won't see your comment as soon as you post it, but I will round them up periodically throughout the day. At Life on the Deckle Edge, Robyn Hood Black's description of David Lanoue's newest book, WRITE LIKE ISSA, had me reaching for my charge card. The book includes six lessons about haiku, and poems by 57 poets, including Robin! And the best news yet- one lucky commenter will win a copy of the book! Many are celebrating nature this week. Aileen Fisher's, "Sing of the Earth and Sky," shared by Catherine Flynn, seems a perfect prelude to all of these. Tara offers an ode to elm trees with Ruth Stone's "Before the Blight." And if Tara's poem makes me long for a cool green glade, Kiesha Shepard makes me want to dig my toes into the sand at the beach. Matt Esenwine celebrates an upcoming week at the beach with an original beach poem. Diane Mayr commemorates the sighting of a brown booby, a bird never before seen in New Hampshire, with a James Tate poem, "The Blue Booby." And at Random Noodling, she continues her delightful catku series. Brenda is channeling her inner William Butler Yeats with an original poem, "Ballooning." At Teacher Dance, Linda Baie glories in sweet moments with her granddaughters. Laura Purdie Salas brings a little silliness with "Keep a Pocket in Your Poem" (yes, you read that correctly) from J. Patrick Lewis' newest poetry book. Over at Year of Reading, Mary Lee uses a new picture book, IF, by Milton and Shirley Glasser, as inspiration for a few playful if's of her own. Kathryn Apel celebrates wonderful wordplay (also awesome alliteration) with a review of GREAT GOAL! MARVELOUS MARK!, a new ABC book about the Australian Football League. Tabatha Yeatts gifts us not only with a poem and a song, but also with a beautiful quote. "It goes without saying that a fine short poem can have the resonance and depth of an entire novel." At Raincity Librarian, Jane shares a Carole King song for difficult days. At Write Time, Linda has an original, not-your-typical Father's Day poem. I wish there were more of these. Jama reviews a brand new picture book MY DADDY RULES THE WORLD, by Hope Anita Smith. This definitely seems like one to add to classroom libraries! Inspired by her visit to the Jones College Prep AP Art Class Exhibit, Michelle Kogan wrote an original cherita (is this form, which seems short and maybe even doable, new to anyone besides me?). It's a good thing that Amy Ludwig Vanderwater came by today, or I never would have known that Margarita Engle was named "Young People's Poet Laureate" for next year. 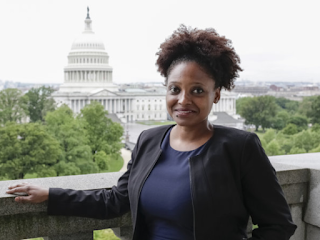 I'm not sure how I heard about Tracy K. Smith, but missed the news about Margarita. This news will be fun to share at my school this fall- more than 50% of our students speak Spanish as their first language. Amy has all kinds of goodies in her post today, hop on over to check out an original poem about frogs, written in honor of a kindergarten class, as well as some original second grade poetry. Ramona is joining Robyn Hood Black to celebrate Issa's birthday, with COOL MELONS TURN TO FROGS, a book I have always loved sharing with kids. Christie Wyman "found" a poem about hummingbirds in the words of John James Audubon. Karen Edmisten is also celebrating summer with William Henry Davies, "Leisure." This topic seems to be cropping up in so many poems that I think the universe must be trying to tell me something! Over at "There Is No Such Thing As a God-Forsaken Town," Ruth is sipping sun tea and looking for summer poems. She found a classic, "What is So Rare as a Day in June?" and several other summer poems. with James Russell Lowe. I couldn't decide whether to laugh or cry when I read JoAnn Early Macken's poem, "Summer Scheduling." I have way too many days like she described! Violet Nesdoly's title, "Ghostly Visible" captured my attention. So much we see, and yet don't see. My father has been gone for over twenty years, and yet I cried this afternoon, when I read Li-Young Lee's poems, shared by Elaine Magliaro. Hauntingly beautiful memories. Margaret Gibson Simon says, "When I write poems, I connect to a deeper part of myself, one who I don’t know as well, one who reveals more of myself to me." Margaret has an original poem, "Remembering Clover," modeled after Philip Levine's Milkweed. Kay McGriff , inspired by Marilyn Singer, not only attempted reverso poetry, but chose a really tough topic, this week's shooting. So sad. Another sad original poem, "Marawi Aftermath: Dancing With Smoke" at Ymatruz Instinct." When I read "See It Through" at Bildungsroman, I think of my sixth grade teacher, Ralph Meyer, who regularly recited Edgar Guest's poetry to us. Jan Goodwin Anino says Canada's Jordan Abel is a poet we can't miss. His newest book, INJUN, sounds like a good place to start. At Enjoy and Embrace Learning, Mandy has a burst of fuchsia and an original haiku. Our final poster, Carol Varsalona, became a grandmother this week, but also somehow made time to snap pictures and write poetry about a gorgeous river sunset. OK, I think I got everyone. If I left someone out, please let me know and I will add you when I get home from the theater tonight. Excited to see CURIOUS INCIDENT OF THE DOG IN THE NIGHT, which has gotten rave reviews! Sometimes life just doesn't quite go as expected. That's where I have been this week. Early Monday morning my phone dinged. A text message. I'm not that much of a phone person, and I don't get that many texts, so I was kind of surprised. It was one of the second grade teachers from my school. She is vacationing in Canada and had gotten a phone call from one of our parents. M had called to say that her husband, Fabian, a stay-at-home 33-year-old dad had passed away after complications from surgery. Fabian had four daughters- a kindergartener, a third grader, a seventh grader, and an eighth graders. The three youngest girls are students at our school. I've worked with two of them in my reading intervention groups. I had just met with Fabian last week to make plans for summer reading. He was a really active dad- someone who goes on all the field trips, supports teachers, and is super proud of his four girls. Since Ang was out of the country, she wondered if I could help. Ordinarily that would probably be a job for a principal, but we have an interim principal, who technically doesn't really start until July, and is currently out of state on vacation. I had spent part of last week with our AP, and knew that she is attending a funeral in California this week. "Of course," I said, not quite sure what handling a situation like that might mean. I waited a couple of hours until it seemed late enough to call, then called M. She seemed like she wanted to talk. She told me that Fabian had liver surgery last week. And was doing better. And they sent him home. But Thursday night he was feeling really badly so they want back to the emergency room. They checked him over and gave him the choice of staying the night or going home. He wanted to go home, but had to be rushed back to the hospital by ambulance later that night. He died the next morning in surgery. I asked how we could help. She said the family needed money to pay for the funeral. And groceries and living expenses for while she was not working. I wasn't sure how to start a collection. Go Fund Me? A special bank account? My school has a Facebook page, but I wasn't sure we could post financial stuff there without special permission. I emailed our instructional superintendent. She emailed the financial advisor for our network. He emailed me and said it would have to be set up through PTA, not a teacher at the school. I called the PTA moms. They would be glad to help, but wanted a picture of the family for the Go Fund Me page. I texted M again and she sent pictures of Fabian with his girls. The pictures made me cry. Again, I was struck by just how much Fabian loved his family. And then there was the letting people know part. I sent an email to teachers at my school. I wasn't exactly sure how many people actually check their email, especially since we had just gotten out of school, so I also sent texts to as many people as I could. My colleagues' responses made me cry again. Lots of people are out of town, but almost a third of our staff have said they will come. The girls will know they are loved. I've been checking the Go Fund Me page all day. We have collected over $1500. Not lots and lots, but at least something to help. Hopefully, four little girls and their mom will feel loved on Thursday. One of my goals for this year was to participate in Poetry Friday every week. Despite that, it's been several months since I posted anything. This summer, I am determined to get back in the groove. Which might be extra good since I am supposed to host next Friday! This week, our first week off (if you don't count four days of professional development), I went to Tattered Cover, in search of new poetry books. I found OUT OF WONDER, by Kwame Alexander, with contributors Chris Colderly and Margjorie Wentworth. Maybe it's not considered new anymore, because it was actually published in March, but it's new to me. 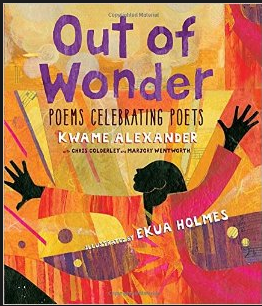 OUT OF WONDER is a collection of poems celebrating poets influential in the life of Kwame Alexander- Naomi Shihab Nye, Mary Oliver, Pablo Neruda, Robert Frost, Sandra Cisneros, Gwendolyn Brooks, Emily Dickens, Terrance Hayes, Sandra Cisneros, Billy Collins, e. e. cummings, Judith Wright, Okot p'Bitek, Chief Dan George, and Maya Angelou. Back matter includes additional information about each poet. The illustrations, by Ekua Holmes, are gorgeous. "How Billy Collins Writes a Poem"
you to breakfast, sounds like a fire alarm. like tiny clouds and guess where it goes. the sound they make when you walk. and that barking dogs belong to a prince. reach up and grab some. and this may be the only need to see. Mary Lee Hahn is hosting Poetry Friday today. A sixth grader. Oldest of three girls. Arrived three years ago, when she was in fourth grade. We were told that her story was sad. It was. Mom had disappeared into Mexico. Grandfather had taken S and her two sisters. They had looked for the girls' mom for several months then returned to Denver without her. All three girls were quiet beyond belief. Not surprisingly, given their lack of schooling and the family's traumatic history, none of the girls read at grade level. And none spoke more than a few words at a time. Or at least none spoke with words. But S did speak. She spoke through her art. Her specialty was pencil sketch hands, thumbs and first finger touching in the shape of a heart. Soon those were all over the school. On the fourth grade teacher's bulletin board. In the assistant principal's office. In her friends' plastic slide in notebooks. There were hand hearts everywhere S had been. Earlier this year, the family had another run of bad luck. The grandfather, the girls' caretaker, was deported. S and her two sisters stayed with the the grandfather's girlfriend. They spent a lot of time at school, participating in almost every after school activity. There was no one to go home to. School was where there was food and kindness,and care. Last week I saw S and her sisters in the office on the last day of school. They were sitting with the school psychologist, who told me that the girls were going back to Mexico. I asked if they had enough books. They showed me a bag they had collected off the free table. I asked S if she had enough paper for drawing. She said she didn't. I found some sketchpads over the weekend and met the girls' caretaker at the school today to give them to her. The caretaker explained, in rapid Spanish that I only partly understood, that she had been caring for the girls, feeding them and buying them clothes, since March. She loves them, but they are not her daughters. They are going back to family in Mexico. She dug her phone out of her purse and showed me the two story stucco dwelling where the family will live. The girls are leaving tomorrow. S was born in the U.S. and can return, if she has someone to take care of her. Her younger sisters, J and K, don't have the right paperwork and can't return unless their family situation changes dramatically. The goodbyes do not get any easier. So this post might fit into the "books everyone has already read and why are you blogging about it now" category, but I just read it, and I loved it, so I'm blogging about it now. THE WAR THAT SAVED MY LIFE is historical fiction. Probably my favorite genre. And it's World War II. Another favorite. A strong, independent female character. Yep. A situation similar to foster care. Yep. And it has horses. Which I totally loved as a child. I still do actually. Ada is a ten-year-old girl living in London with her mother and younger brother, Jamie, at the start of World War II. Ada was born with a club foot. Her mother, embarrassed by her twisted foot, has kept her hidden away in their one-room apartment for almost a decade. Ada does not even have crutches or a pair of shoes. She crawls around the apartment on scabbed and bleeding knees, finally teaching herself to stand upright and walk at age ten. When World War II starts, the children from Jamie's school are going to be protected by being taken out of the city. Ada hears about the transport, and steals her mother's shoes so that she can escape with Jamie. A neighbor child carries her piggyback from the school to the train station. Ada and Jamie end up on a farm with Susan Smith, a woman in the deep throes of depression after losing a dear friend. Although Susan does not want to take the children, somehow the three become a family of sorts. She provides the children with life's necessities- food, clean clothes, baths, books. Ada falls in love with life on the farm, including a stubborn pony named Butter. She also becomes friends with other villagers, Maggie Thorton, a wealthy girl from a nearby estate, and the stableman from that estate, Fred Grimes. I loved this book. And the good thing about reading it so late is that I only have to wait until October for the sequel, THE WAR I FINALLY WON. You can bet I won't be waiting two years to read that one!